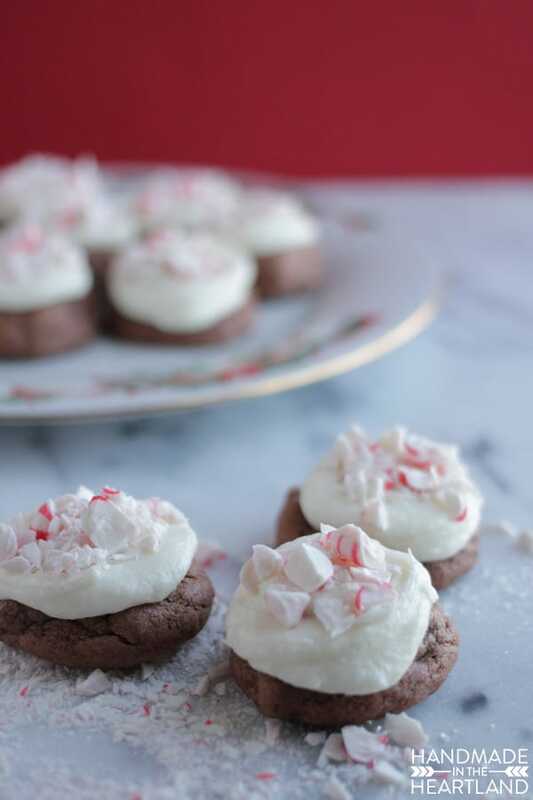 These delicious peppermint pudding cookies are loaded with yummy chocolate and would be perfect for a cookie exchange or bake sale! Christmas baking season is upon us and I’ve got a great cookie for you to add to your baking roundup. 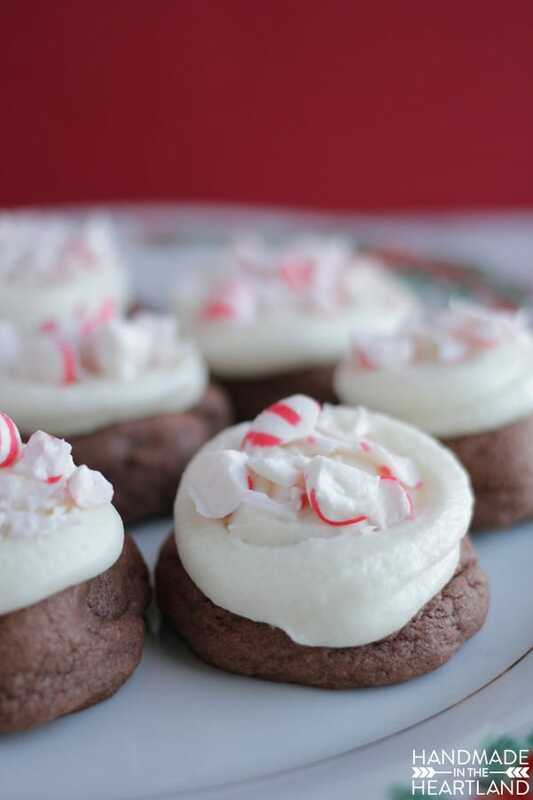 These chocolate peppermint pudding cookies are easy to whip up and with the added icing and peppermint sprinkled on top you’ve got a bona-fide Christmas cookie! Do you do a big holiday baking day? 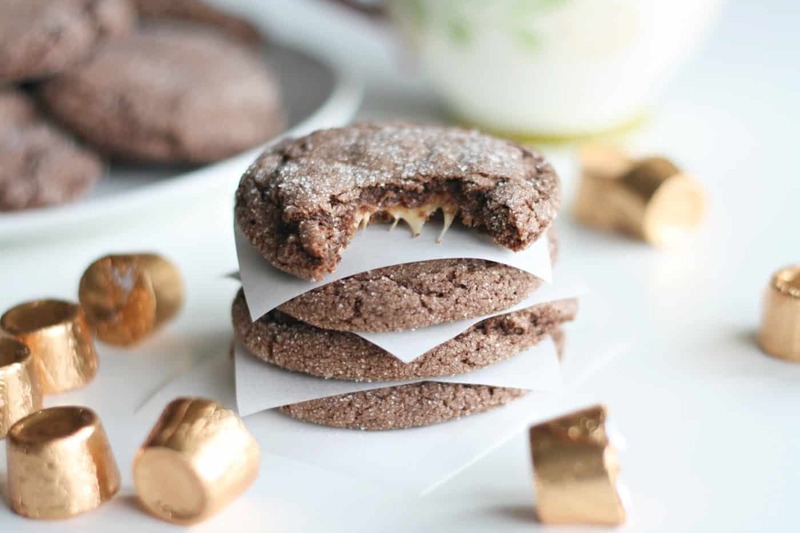 Who do you give your cookies to – do you do a cookie exchange? I think I’ll be deliver some plates to those whose work is under-appreciated this year like my mailman, trash collectors, house cleaners, and (of course) Max’s teacher. I’d love to hear who you take your baked goods to. I have a few essentials in my kitchen when it comes to baking, and my Silpats are fantastic. 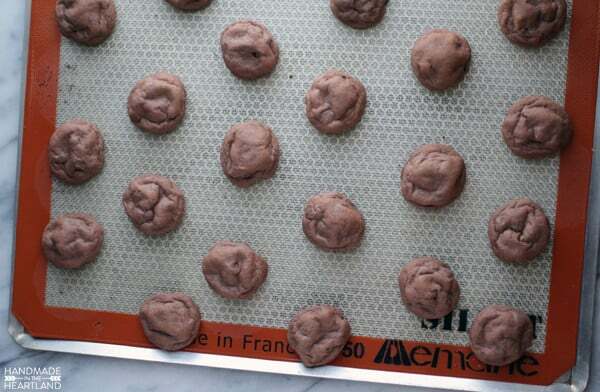 They help my cookies bake perfectly even on the edges, and the cleanup is a breeze! I also really love my cookie scoops; it totally makes the whole process so much easier. 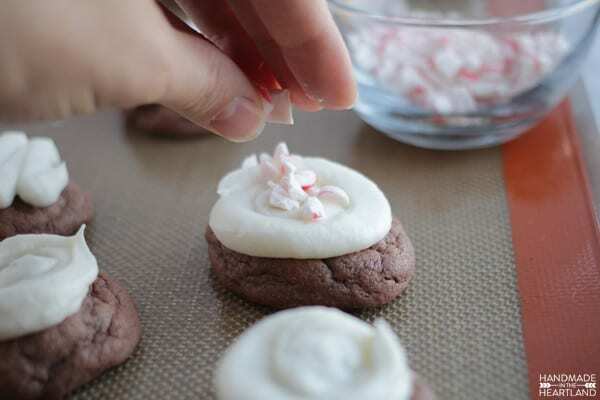 To make the peppermint topping, I crushed peppermints while they were inside a Ziplock bag. I used a mini hammer because a rolling pin just doesn’t work well with these guys. 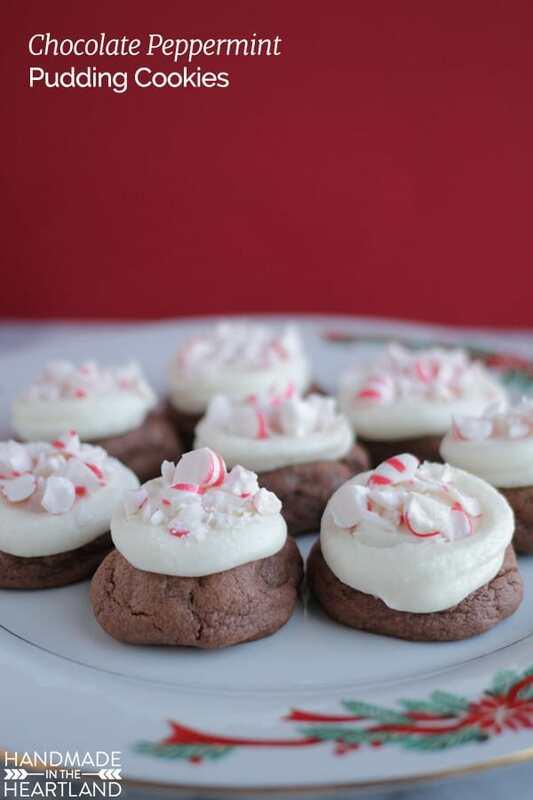 If you have leftover peppermint shards, make peppermint marshmallow hot chocolate sticks. They are delicious! 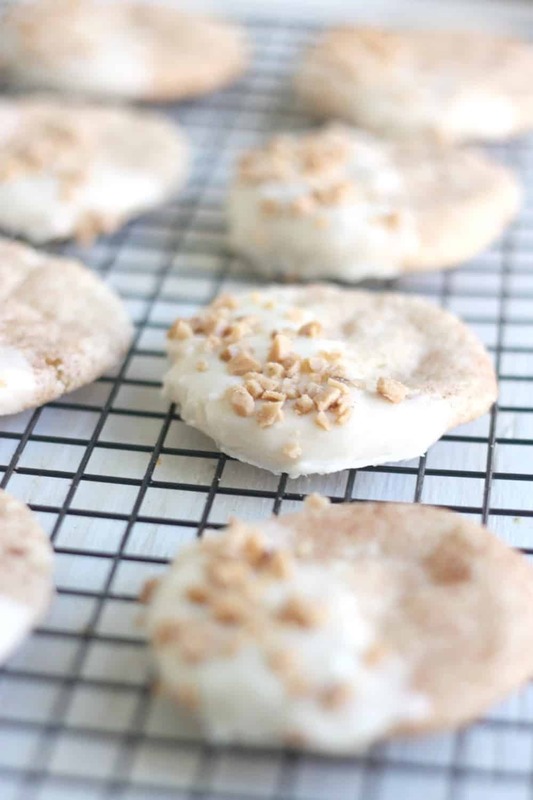 You’re going to make a delicious buttercream icing for these pudding cookies. 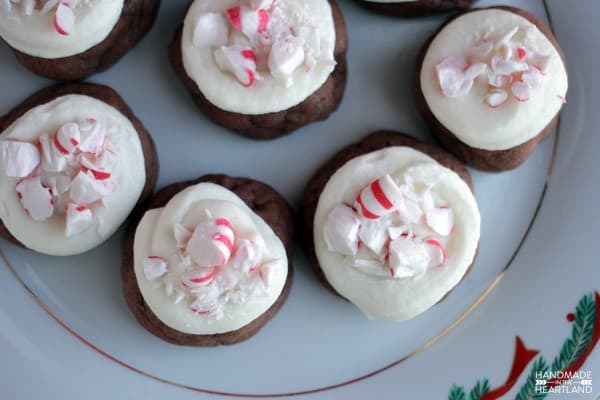 And FYI – you don’t have to use the peppermint extract in the icing if you don’t want to. 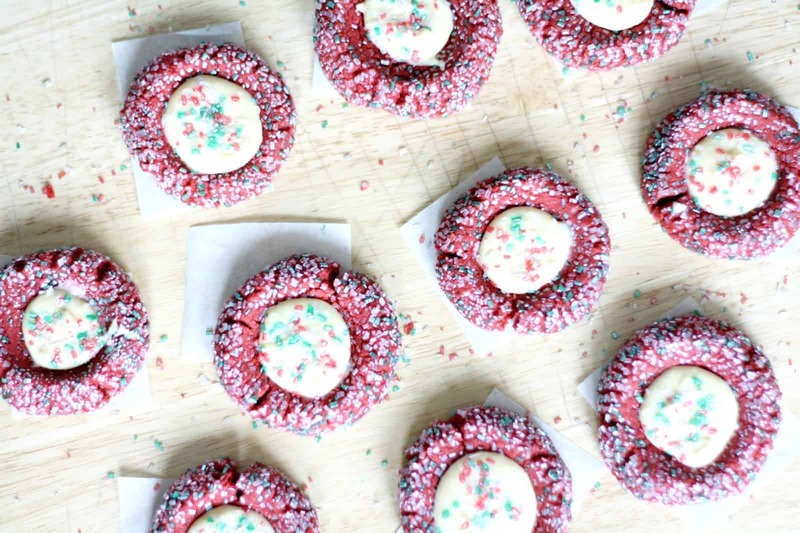 It just adds to the peppermint flavor and, if you are not going to use the crushed candy canes, I recommend doing it to make the cookies actually flavored like peppermint. 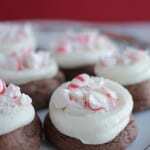 BUT if you don’t love peppermint that much, you can also just substitute with vanilla extract. I can’t tell you how much easier it is to spread icing with it in a pastry bag than with a knife, seriously it’s totally worth the extra couple minutes to pull out a pastry bag and pop the icing in there. If you’ve never used them before just pick up a pack next time you’re at Walmart or the craft store – I prefer the disposable because then you don’t have to clean them after. Cream the butter and sugar, add the eggs and pudding mix, beat until smooth and creamy. Add the baking soda and then the flour and mix until combined. Scoop onto silpat lined baking sheet and bake at 375 for 8-10 minutes. While the cookies are baking, make the buttercream icing. Do this by first beating the butter (preferably with a paddle attachment on your mixer) until smooth. 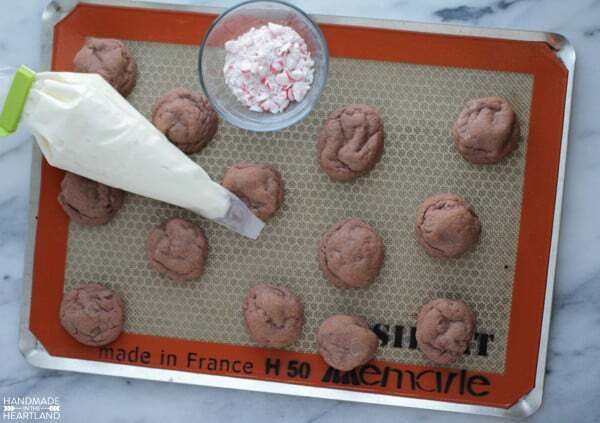 Add half the bag of powdered sugar, the milk, and the peppermint extract to the butter. Place a towel over your bowl and mix on low speed. Once it's all combined, add more powdered sugar until it gets to the consistency you like. If it ends up too thick, simply add more milk. 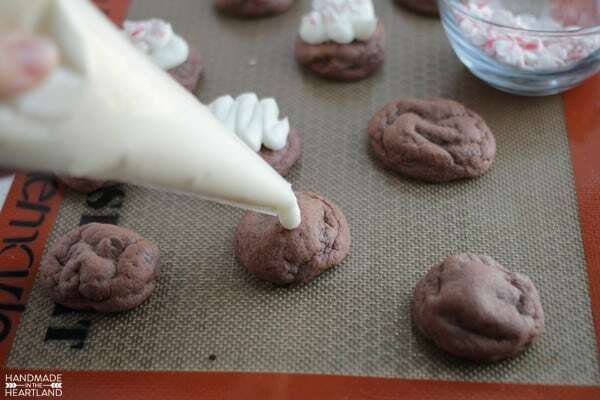 After the cookies cool, place the icing in a pastry bag and squeeze on top of the cookies. Let set. Sprinkle crumbled candy canes on top if you like! Recipe makes 24 - 30 cookies. Nutritional information is shown for a 24-cookie batch. Get my tips for making and working with the buttercream icing here. 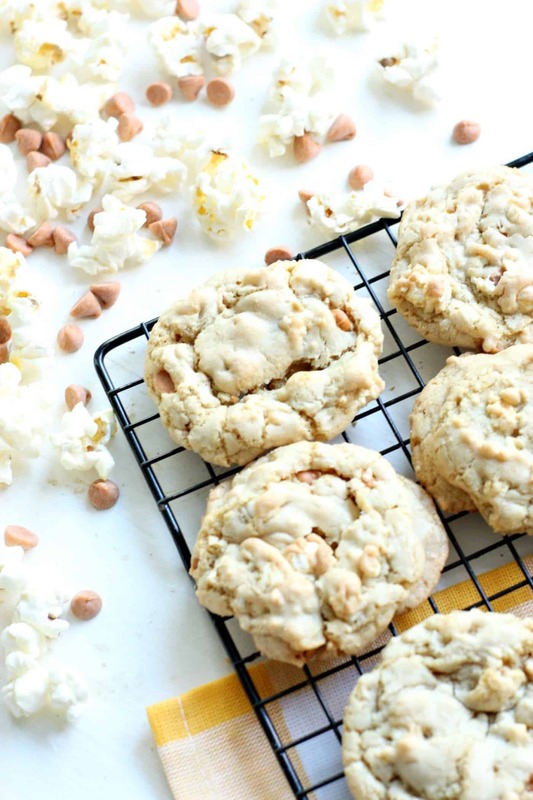 You’re going to start making this icing for every cookie you eat (and every cake too!). I hope you enjoyed this post! If you’d like, please pop over to Handmade in the Heartland to see more of my creative projects.